The guests attending the program were Mr. Vu Tuan Dung, Member of the Commission, Secretary of the Party Committee of universities and colleges in Hanoi, Dr. Hoang Duc Minh - Head of Department of Teachers and Educational Managers, Ministry of Education and Training, representatives of the Offices, Departments of Ministry of Education and Training; representatives of Departments of Education and Training; representatives of schools in the Universities of Education Club of the; leaders of education centers, partners of the university. 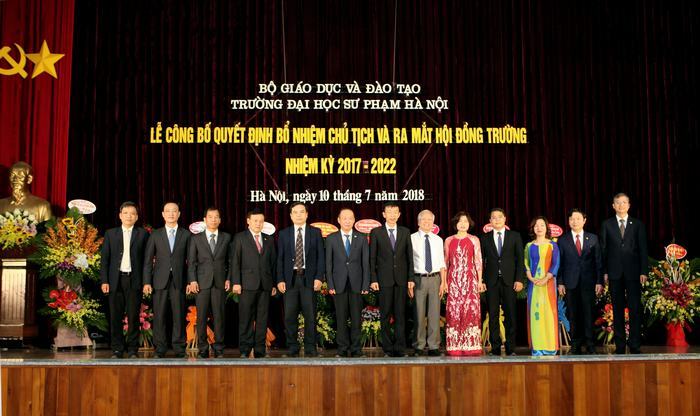 In Hanoi National University of Education, there was the attendance of Prof. Dr Do Viet Hung - School board chairman, Prof. Dr Nguyen Van Minh – President of Hanoi National University of Education, Assoc. Prof. Dr Dang Xuan Thu – Party secretary - Vice President of Hanoi National University of Education, School board members term 2017-2022, members of Vietnamese communist party, Board of trustees, Head of Trade Union, Youth Union, former head teachers of the school; former Rectors, Secretaries of the Party Committee in each period; National Teachers; leaders of faculties, departments, centers, publishing houses, high schools, attached preschools; Board of Directors and leaders under in Ha Nam branch; representatives of staff, lecturers, pupils, students, learners and doctoral students of the university. Journalists and press agencies also attended and reported. 9. Assoc. Prof. Dr. Truong Thi Bich – researcher - Director of Research Institute of Pedagogy. 10. Assoc. Prof. Dr. Phan Thanh Long – senior lecturer of Psychology and Pedagogy Faculty– Head of Personnel Management. 11. Assoc. Prof. Dr. Nguyen Van Hien - senior lecturer of Faculty of Biology – Head of Students Affairs. 13. Dr. Pham Tat Thang - Deputy Chairman, National Committee for Culture, Education, Youth, and Children of the National Assembly. 14. Assoc. Prof. Dr. Le Anh Vinh - Deputy Director, Institute of Science Education Vietnam. 15. 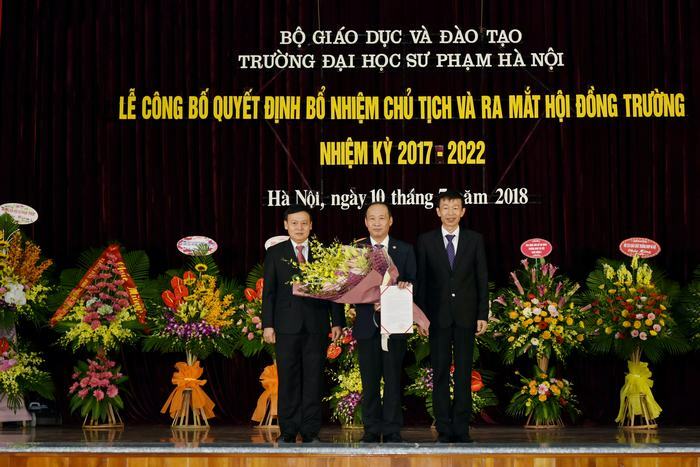 Dr. Nguyen Van Hoa - Chairman of the Board of Nguyen Binh Khiem Secondary and High School, Ha Noi. 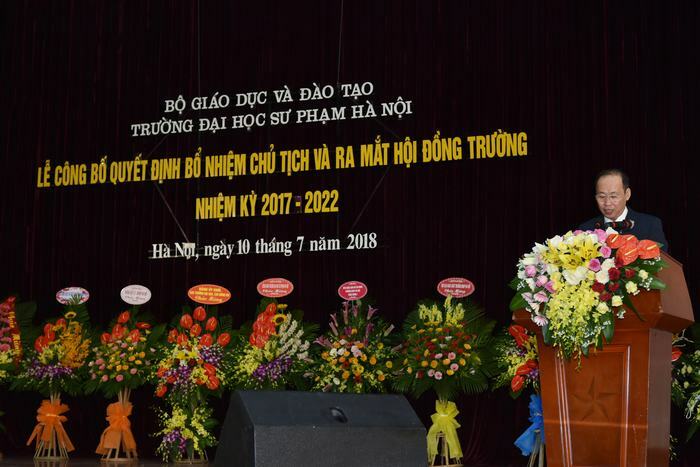 Prof. Do Viet Hung was assigned to be School board chairman of Hanoi National University of Education, term 2017 – 2022. When giving speech in the Announcement, he affirmed the urgent requirement to organize School board, which meets the responsibilities of tertiary education in new era. 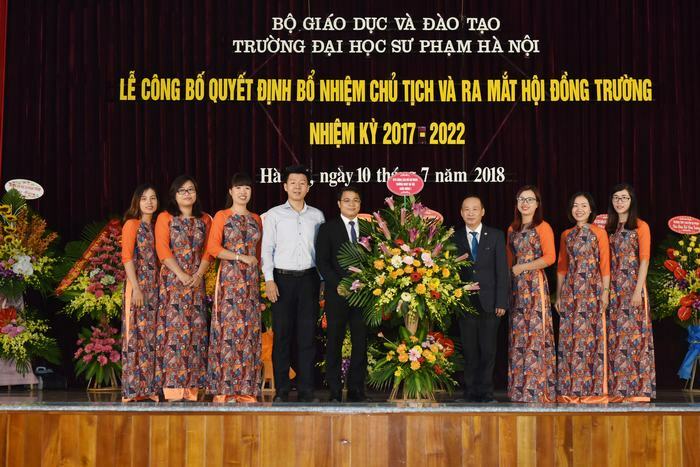 In addition, the first School Board of Hanoi National University of Education has the responsibility to lay the foundation for their activities, on the other hand, perform the functions and duties of the Council for a sustainable development of the university. 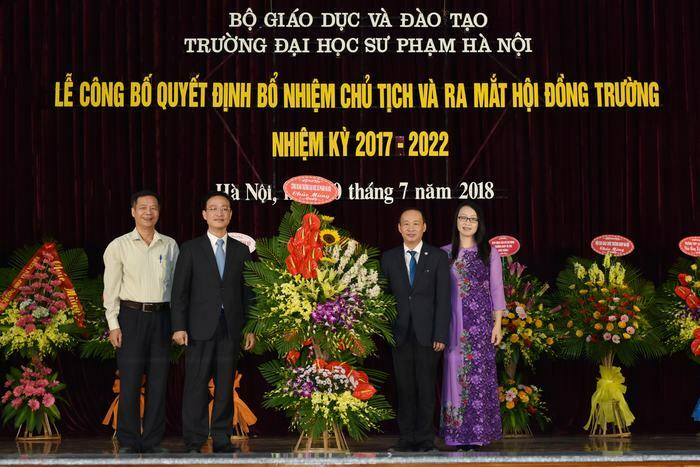 He also expressed his wish to receive the support of the Party Committee, the solidarity of the members of the Board, the effective coordination and implementation of the Board of Trustees, the divisions of the university, especially the support and solidarity from all staff of the school to make the Hanoi National University of Education become a national key school. 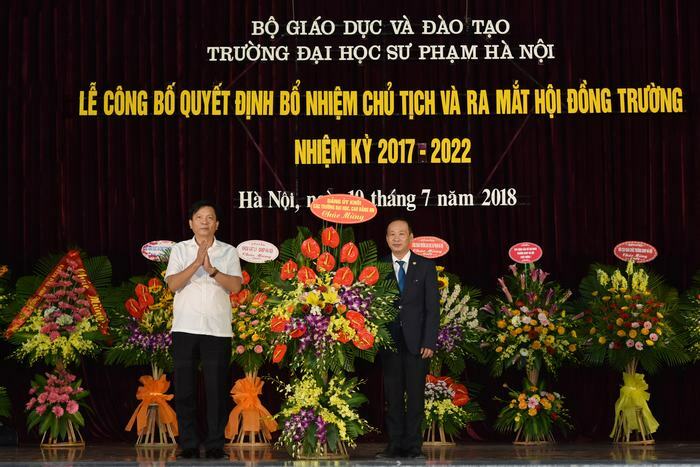 Furthermore, Prof. Dr. Do Viet Hung showed gratitude to the Party Committee of the Ministry of Education and Training, the leaders of the Ministry of Education and Training, the Communist Party of universities and colleges in Hanoi who entrusted and assigned the job to the School Board; finally the Party Executive Committee, the Board of Trustees and all staff of the school.